The Martian Manhunter (aka J'onn J'onzz) has been living as Detective John Jones for a few years. After a recent car accident, his partner Diane discovered his secret and is begrudgingly working with him to solve a series of strange murders. These are hitting a little close to home for J'onn, bringing up memories of his life on Mars and all that he's lost. J'onn is uniquely suited for a job as a detective because of his various abilities. He's able to track down the victim's pet iguana and do a mind-meld of sorts to see through its eyes. This is presented in a couple of incredible double page spreads from artist Riley Rossmo. If you've ever wondered how a reptile sees the world, wonder no longer. This is a visual tour de force that really stretches the boundaries of the comic book medium. 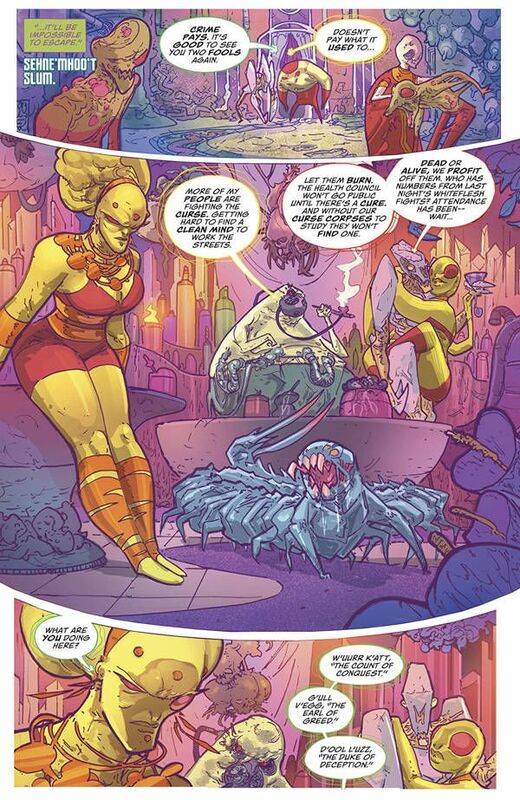 Rossmo's artwork is perfectly suited for Martian Manhunter, both for the trippy elements like this and for the horrifying ones. 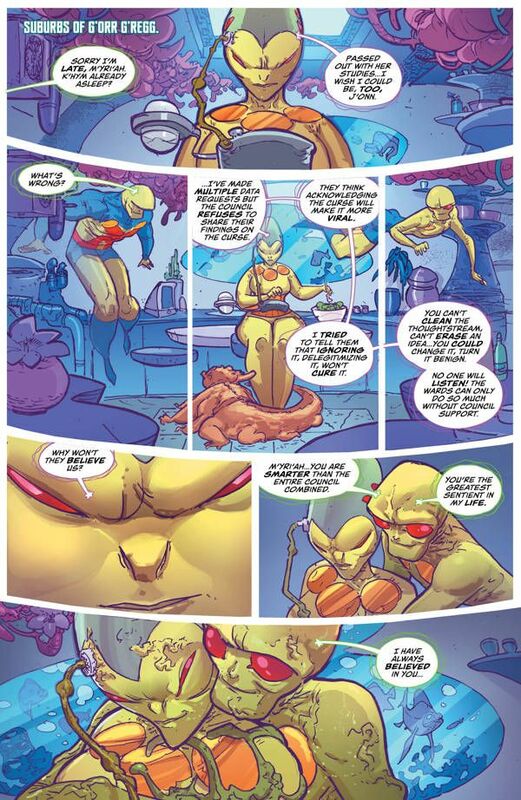 One of J'onn's key powers is shape-shifting and Rossmo brings that to life in the most unsettling ways. Remember how creepy the werewolf transformation was in An American Werewolf in London? Multiply that by a thousand and you might be close to how frightening this looks. J'onn is just half of it. The villain stands revealed in this issue and he's ripped right out of a nightmare. Picture the boogeyman given life. Colorist Ivan Plascencia makes this creature pop on the page with a startling red. It's like he's made of blood and sinew. His very existence looks painful and he's taking that rage out on the world. This guy even speaks in a frightening manner. 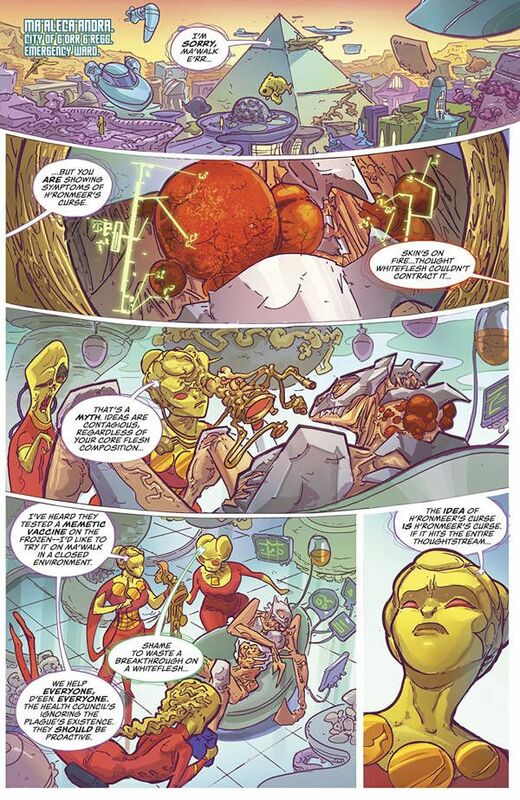 Letterer Andworld Design uses traditional word balloons surrounded in these haunting, squiggly red lines, almost like his speech has an echo to it. This only adds to the terrifying nature of this being. Matched up with his appearance and actions, it's clear that he's going to be a formidable foe for J'onn. 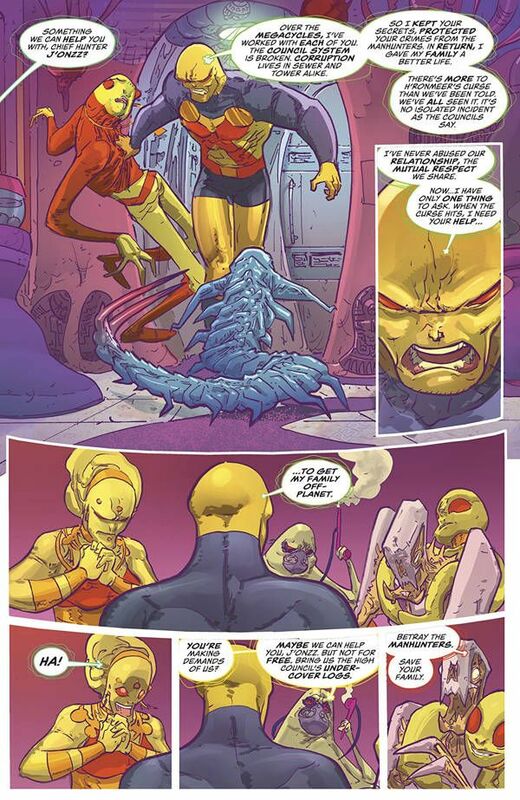 While all these elements add up to a great story, writer Steve Orlando takes it over the top with some incredible character development, digging into J'onn's life on Mars. His family life back home contrasts with the lonely one he leads now. This humanizes the character and I realize how strange that might sound because he's literally a green, shape-shifting alien. You sympathize with him more knowing everything he's been through. 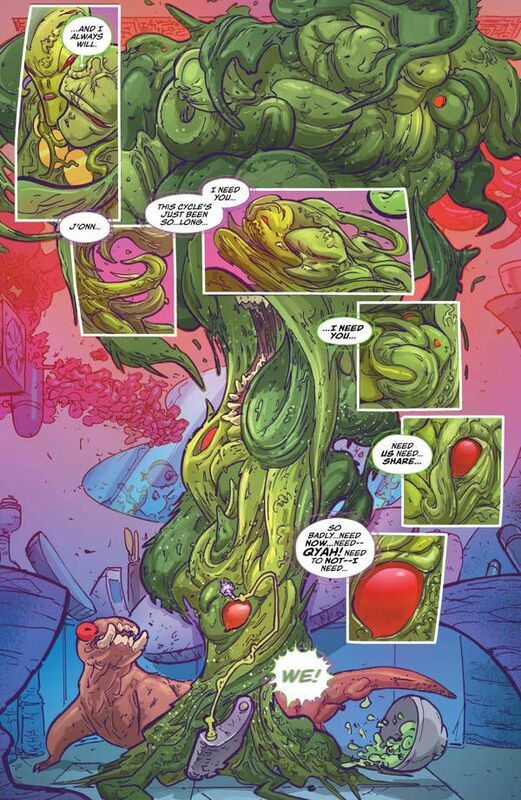 Martian Manhunter is like True Detective meets Cronenberg's The Fly. It could have been a satisfying crime story on its own. Adding in heaping helpings of body horror, alien carnage, and pure unbridled terror makes it a must read.